Acacia albida | Infonet Biovision Home. 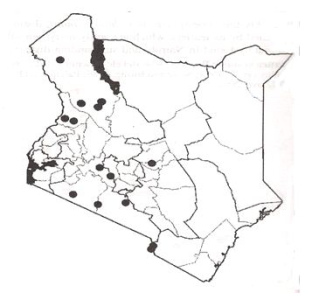 Maasai (Olasiti); Nandi (Seretuet); Pokot (Sangale); Sabaot (Dalyet); Samburu: Larai; Taita: Iti, Mukababu; Taveta: Mkababu; Teso (Edurkoit); Turkana (Edurukoit). This tree is distributed from the Middle East through eastern Africa and south to South Africa and Namibia. Also west through the Sahel to Gambia and Senegal. In Kenya, it is common in Rift valley along R. Turkwel around Oloitoktok; also in Taveta. This tree is native to Angola, Botswana, Cameroon, Eritrea, Ethiopia, Israel, Kenya, Lebanon, Lesotho, Mozambique, Namibia, Senegal, Somalia, South Africa, Sudan, Swaziland, Syrian Arab Republic, Tanzania, Uganda, Yemen, Republic of, Zambia and Zimbabwe. The species is commonly used in agroforestry in W. Africa where it's grown widely spaced and intercropped in sorghum and millet. It is deep rooted and its wood is not durable in the ground. Naming of species has been moved between Acacia albida and Faidherbia albida, and the taxonomy is still not clear. Future name changes may occur. Altitude: -270 - 2700 m, Mean annual temperature: 18-30 deg. C, Mean annual rainfall: 250 - 1200 mm, Soil type: Coarse-textured well-drained alluvial soils. It tolerates seasonal waterlogging and salinity but cannot withstand heavy clayey soils. Does well in agro-ecological zones IV - VII (riverine). Seedlings and direct sowing at site may be used for propagation. Pruning in the 2nd year to about half the tree height may be needed to control low branching. Repeated pruning during periods of average biomass production stimulates leaf production. It can be pruned twice a year. Resulting re-growth is especially vigorous in the 1st year but decreases as exploitation continues; trees show stress at the end of the 6th year. Regular lopping (once every 3 - 4 years) removing 0.4 - 0.5m3 of foliage (or 35% of the total volume) at the start of the growing season is recommended. However, care should be taken as improper methods of lopping have been observed to cause wounds, predisposing the tree to attack by pathogens. This tree responds well to coppicing. 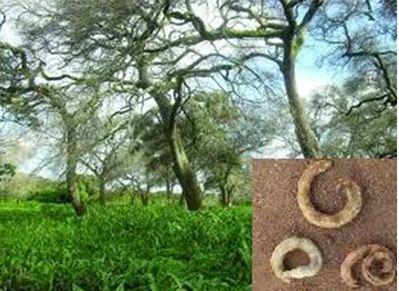 Food: During the dry season, people eat the seeds and pods (eaten cooked or raw in times of famine by the Pokot and Turkana) and also pods may be used in flavouring. Fodder: The leaves and pods are palatable to domestic animals and an important source of protein for livestock in the dry season. Apiculture: For bee-keepers, it has the advantage of producing flowers at the end of the rains while most of the sahelian species flower just before or during the rains. It therefore becomes the main source of pollen and nectar at this time. Fuel: The plant stems are used as firewood. The calorific value is estimated at about 19.741 kJ/kg of dry wood. Charcoal yields are low (17%) of the biomass. Timber: The heartwood (specific gravity 0.56-0.71) is pale and creamy, brown sapwood slightly paler than the heartwood. The wood is susceptible to staining fungi and pinhole borer when green; therefore, it is left to soak for several months to remove sap and minimize attack by fungi, borers and termites. Even after the most careful seasoning, the boards tend to spring and twist one or two hours after they are sawn. The wood works fairly easily by hand, but a smooth finish is difficult to obtain. Care must be taken when nailing, bolting and joining. It is used to make utensils, canoes, furniture, boxes, drums and oil presses. Medicine: The use of bark and roots either externally or internally against respiratory infections, digestive disorders, malaria and other fevers is widespread. The bark can be used to clean teeth, as it is believed to contain fluorine; a bark extract is used for treating toothache in humans and eye infections in livestock. Fibre: its bark may be used for making strings. Shade or shelter: F. albida is maintained and protected on farms to shade coffee and to provide shade for livestock in the dry season. Reclamation: The plant's spreading root system offers excellent protection to the banks of watercourses. Ornamental: A useful ornamental tree for gardens and avenues. Boundary/barrier/support: Branches lopped for fencing compounds and livestock enclosures. Windbreaks: the tree is also useful when it comes to shielding buildings and even weaker crops from strong winds. Ficus thoningii and Taphinanthus dodoneifolius are epiphytes that kill the plant through strangulation. Nematodes and insect pests include bruchid beetles, which attack the seeds, Kraussiana angulifera and Tylotropidius gracilipes (Orthoptera), which attack young plants, and Cypsotidia angulifera, C. mesonema and C. wollastoni (Lepidoptera), which attack the leaves.